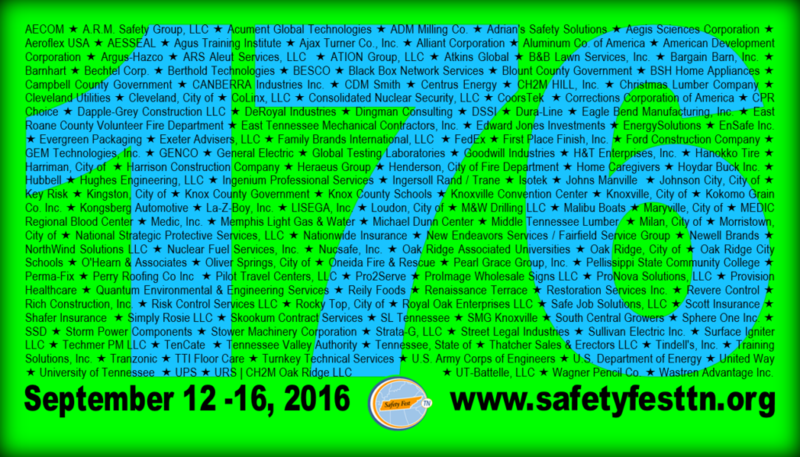 Safety Fest TN is the combined efforts of large and small businesses; federal, state and local agencies; and non-profit organizations that come together to promote safety and health at work, at home and in the community. A common question. Currently, 176 organizations are represented by registered attendees. Safety Fest TN attendees come from the biggest public utility to the smallest utility district; from global powerhouses in the engineer, procure & construct world to boutique A&E firms; from the largest national laboratory to small highly-specialized labs; from nationally known research and education non-profits to very small local non-governmental organizations. And, wait, how does Safety Fest TN happen? Simple question with a simple answer. It’s possible due to the very generous support of Partners, Sponsors and Providers (see image below). To-date, more than 85 organizations are providing financial and in-kind support to the event. Surpassing last year, they are providing over 80 free safety and health classes, sessions and demonstrations in Oak Ridge and Knoxville, Tennessee. So far, the 2016 event’s Partners, Sponsors and Providers! How do my employees get registered?